Are you obsessed with the off the shoulder trend? 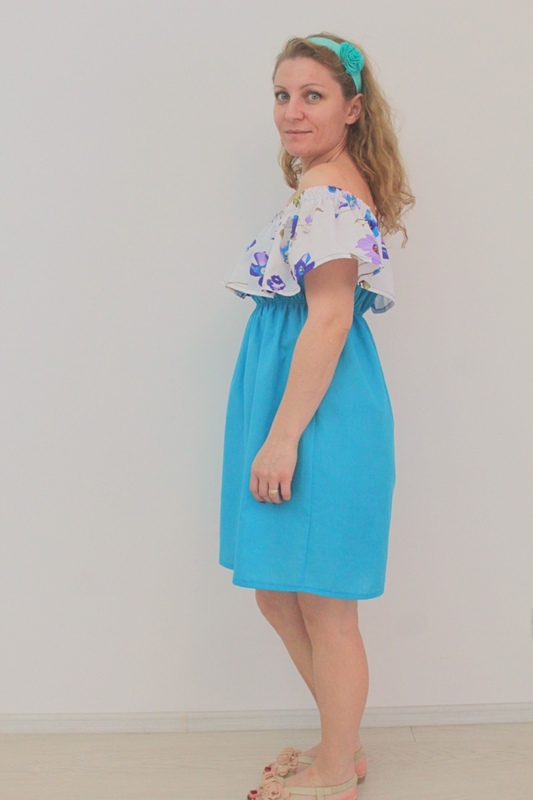 Making yourself an on-trend item that will make you feel so sweet and fancy is so easy with this cute off the shoulder dress pattern! I know the summer is still far but I’m so into sewing summer pieces right now, I just can’t help myself! I love anything sweet, girly and comfortable and this adorable off the shoulder dress pattern is just that! When I made this ruffled wrap skirt I ended up with lots of fabric and I thought I should use up as much of it as possible. So I decided to make a dress in the same fabric. 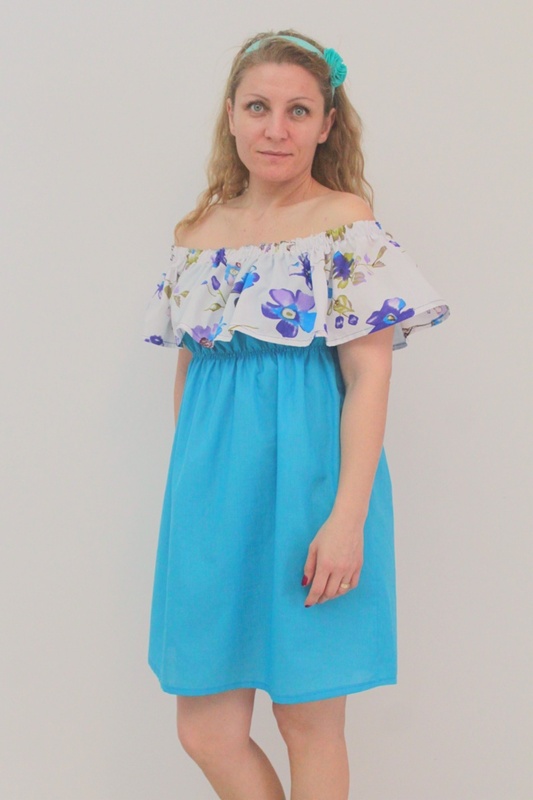 But for this off the shoulder summer dress I swapped the fabrics, using the blue one for the main dress and the floral fabric for the ruffle as an accent. 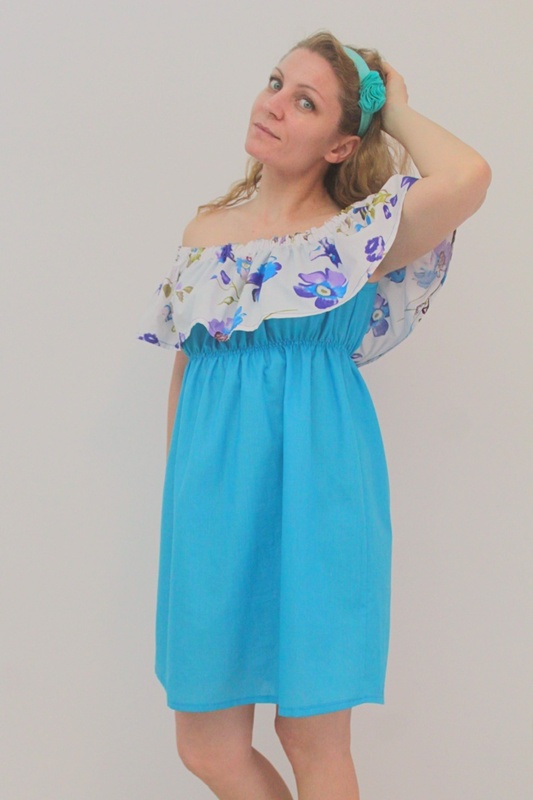 This off the shoulder ruffle dress turned out super lovely and cute and wearing it is crazy comfortable, I totally see myself wearing this awesome dress all summer long! 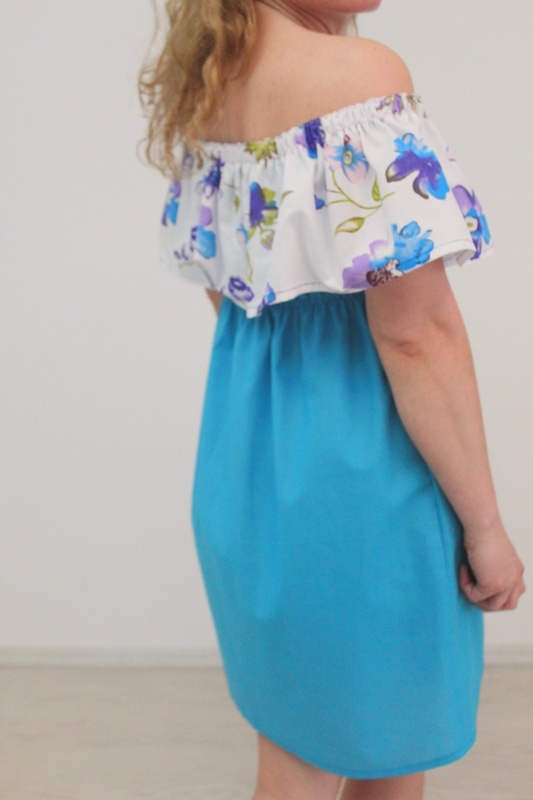 Making your own off the shoulder dress is very simple but if you have two left hands when it comes to pattern drafting, I made a pattern for your convenience (pattern comes in sizes 6, 8, 10 12). I admit that I didn’t plan to add any shirring to my dress but to be honest, because of the cotton fabric I used, the dress seemed a bit baggy and not looking too pretty. 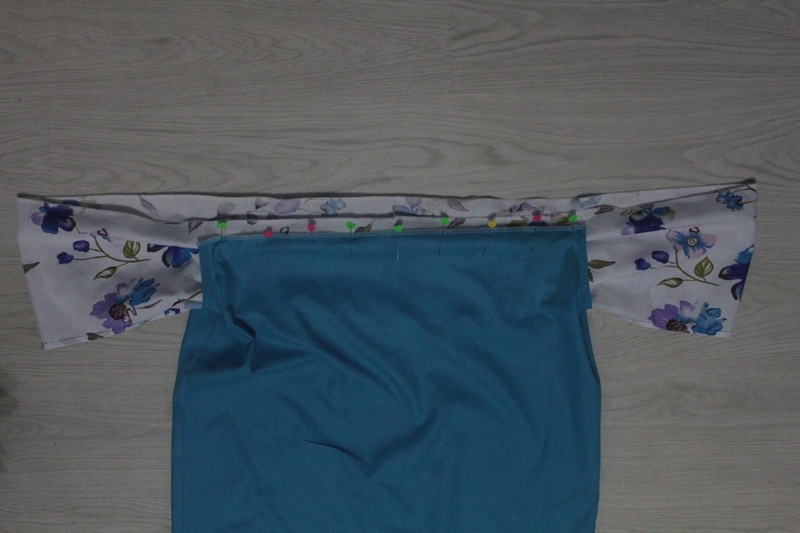 And since I’m hooked on shirring lately and adding a line or two of shirred stitches takes just a couple of minutes, I thought why not try a shirred waistline. I added the shirring just below my chest for extra cuteness and also because to me a high waist feels more comfortable. This adorable off the shoulder dress pattern is also super versatile, it can be casual or dressed up for a special occasion. 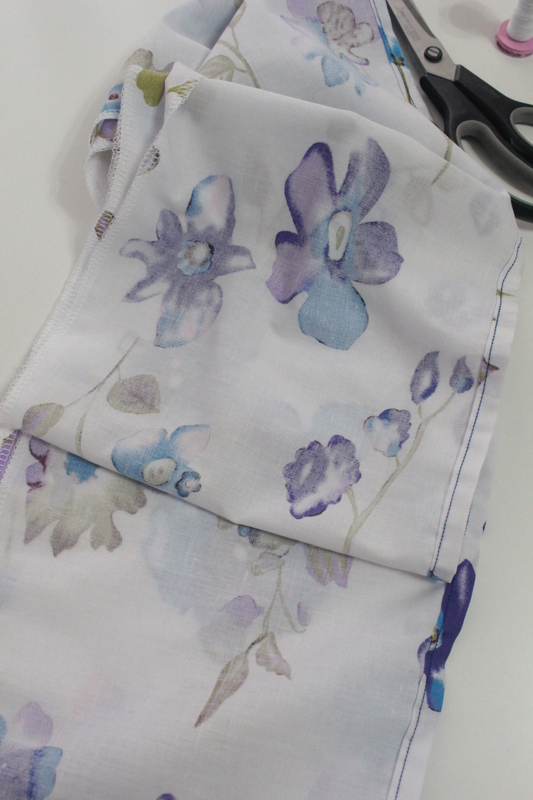 You can make the hem shorter or longer or add trimming for extra details. 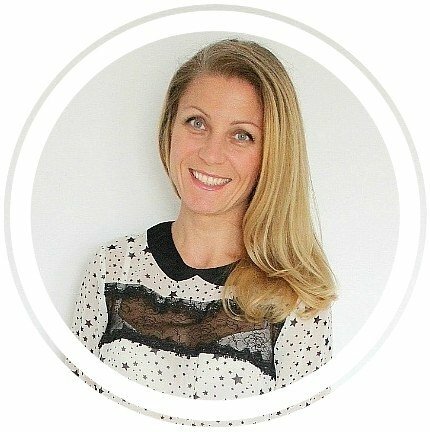 You can use lightweight fabrics for a formal dress or add lace to the hem to make it the perfect dress for a special occasion. The pattern is available to purchase here or you can get it for free when you join my sewing newsletter which will also give you access to my entire current and future sewing library. You need 2 panels of fabric, for the front and the back dress. 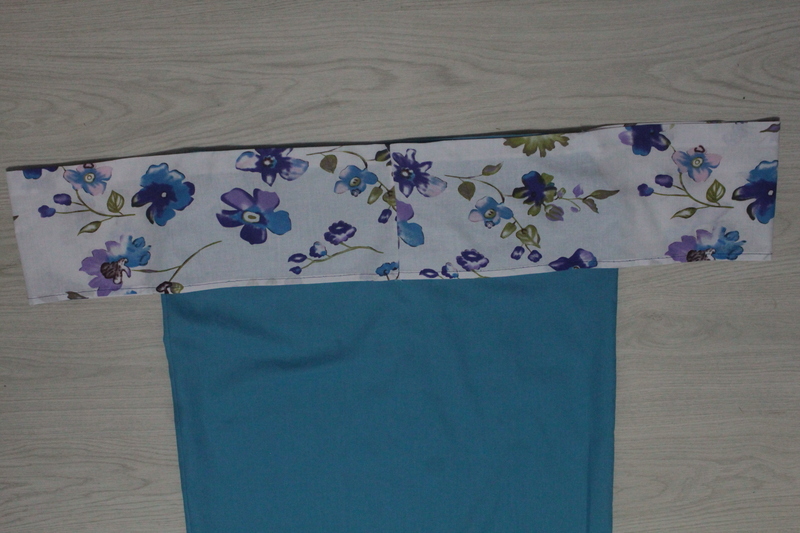 Place these two panels right side together and fold in half lengthwise. Place the pattern on the fold and cut. Measure around your shoulders and double that amount. Cut a long strip of fabric in this length and as wide as you like your ruffle to be. I chose a 7″ wide ruffle and added 1″ allowance for hemming and sewing the ruffle to the dress. Pin the sides of the front and back dress, sew with 1/4″ allowance then finish the seam with a serger or a zig zag stitch. 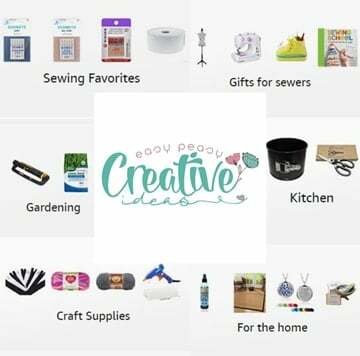 Use this tutorial to make your own double folded bias tape or use store bought bias that matches your fabric. 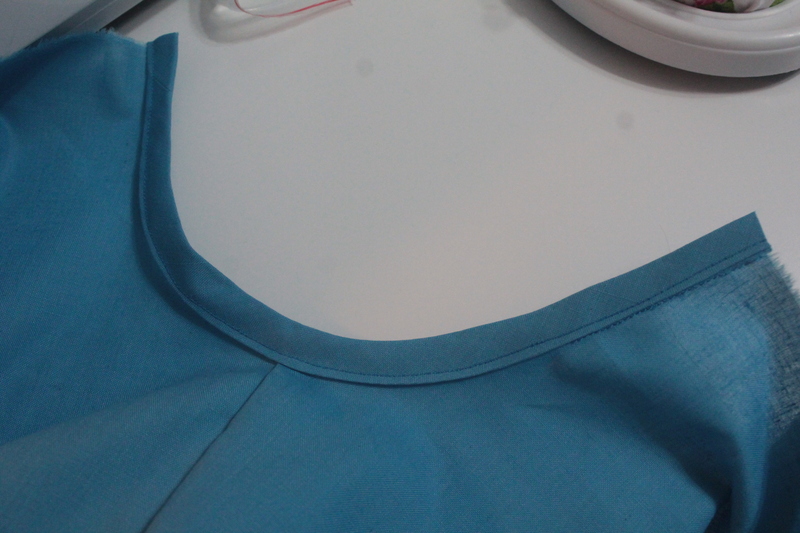 Sew the bias to the armholes using this tutorial. Alternatively use single fold bias and follow this tutorial to apply it to the armholes. Hem the dress using the desired method (I used this tutorial to hem my dress). Press well. 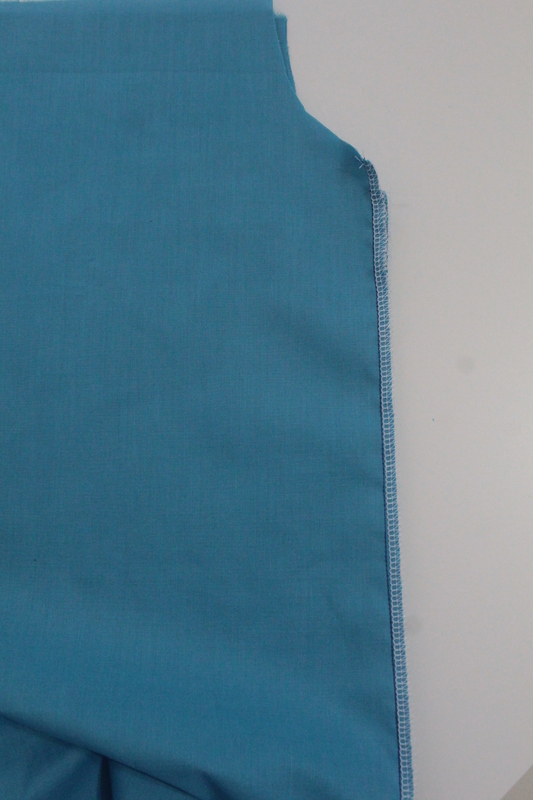 Finish the top of the dress with a serger or a zig zag stitch. Hem the ruffle strip using a narrow hem. Press well. 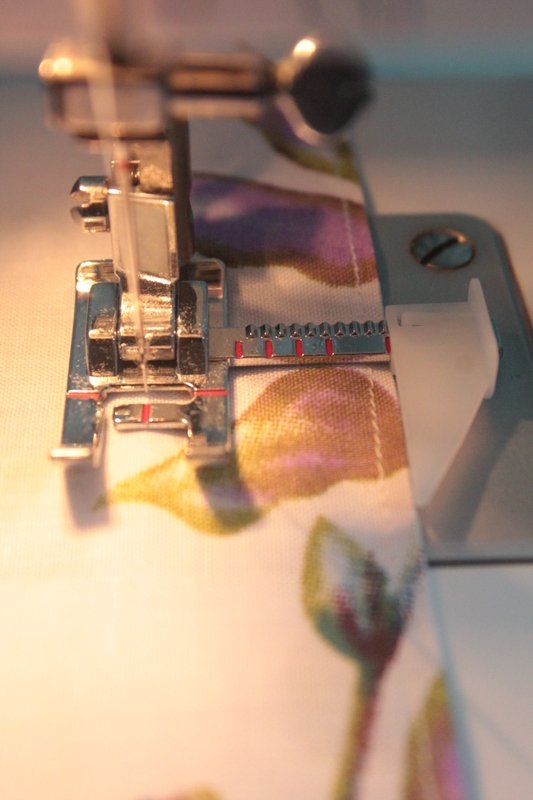 Serge the opposite edge or use a zig zag stitch to finish it. 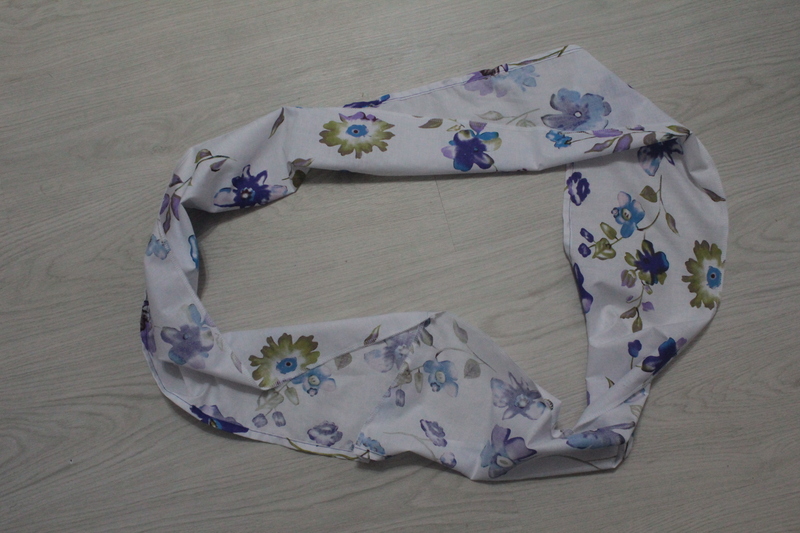 Pin the ends of the ruffle strip and sew into a circle, with 1/4″ allowance. Serge or zig zag the seam. To apply the ruffle to the dress you need to have the dress right side out and the ruffled also right side out. With the seam in the back, slip the ruffle inside the dress through the top, with the ruffle hem pointing down. 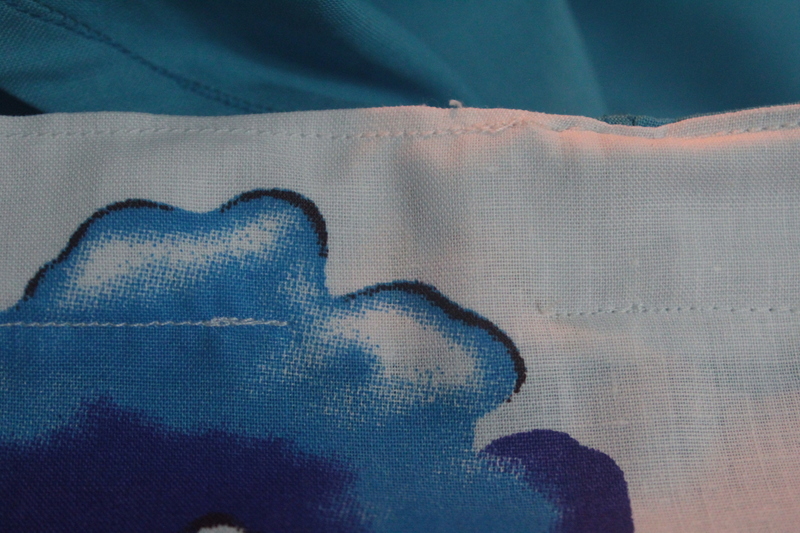 The serged edges should match. 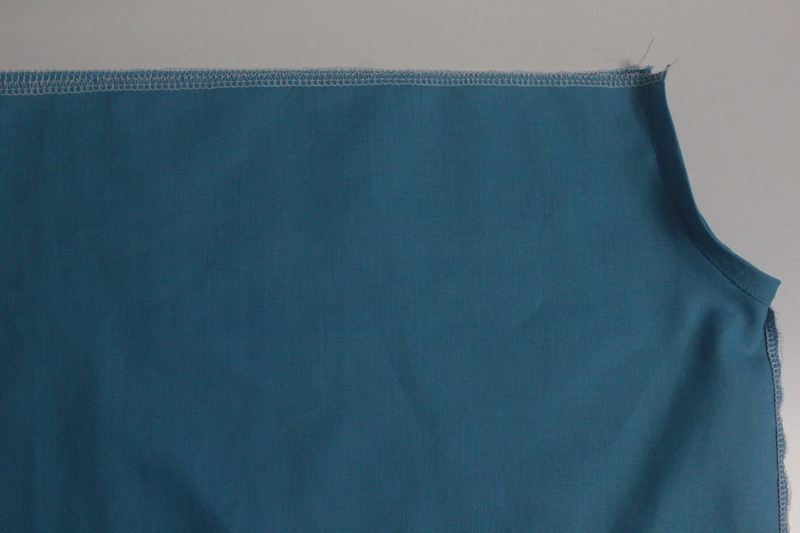 Measure the width of your elastic and mark that width onto the serged edge of the ruffle. Pull the ruffle out the dress a little, until the part that is peaking out is as wide as the elastic. Pin the ruffle onto the top of the dress. 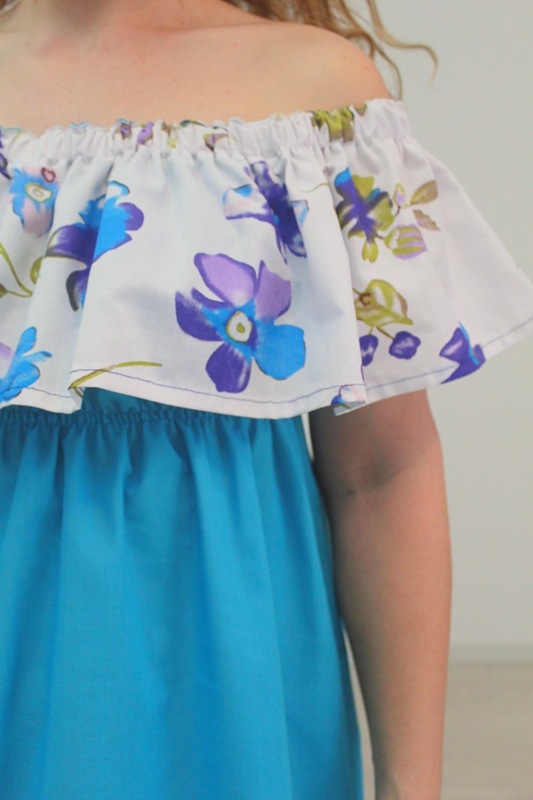 Sew the ruffle to the dress with 1/4″ allowance. Pull the ruffle out and fold down over the dress top. Edge stitch the top of the dress, continuing sewing all around the ruffle. Mark the width of elastic down the edge stitch. Sew following this marking line, continuing sewing all around the ruffle. When you get to the end, leave a gap of about 1″. 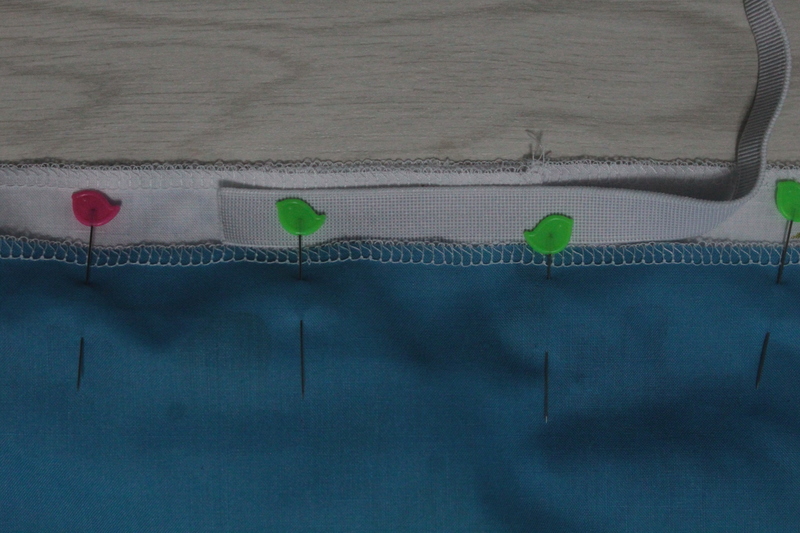 Insert the elastic through this gap using a safety pin. 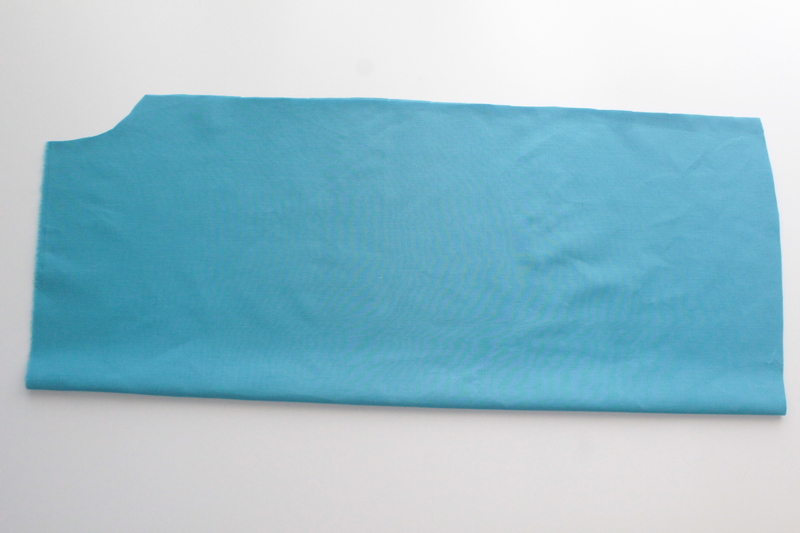 Sew the ends of the elastic together following this tutorial. Sew the gap closed and spread the ruffles evenly. Try the dress on and decide where to you want the shirring elastic. 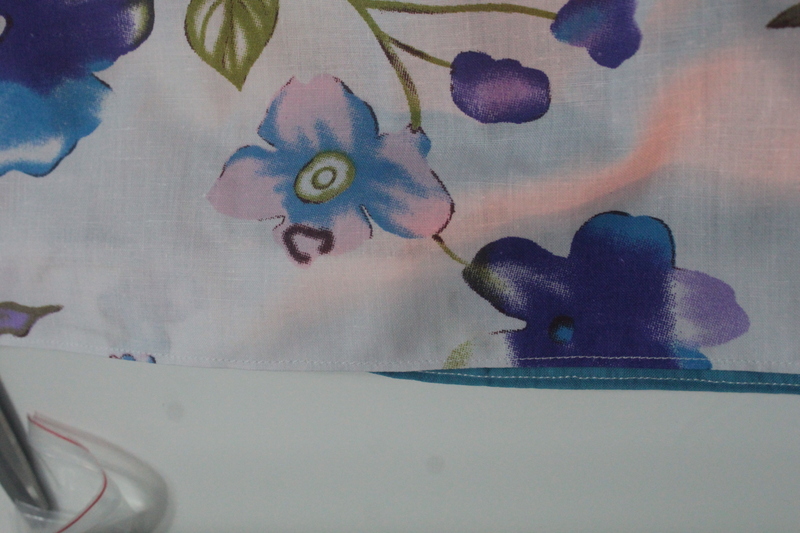 Sew 2-3 rows of shirring around your dress. And your pretty off the shoulder dress is done! Enjoy! If you liked this tutorial please let me know in the comment section below and don’t forget to rate it! Thanks!